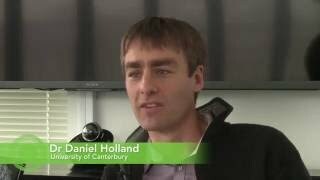 Dr Daniel Holland has a strong track record of applying novel measurement and mathematical analysis techniques to improve efficiency in the chemical industries. He graduated with a BE(Hons) with First Class honours from the University of Canterbury. Since completing his PhD in Chemical Engineering at the University of Cambridge in 2006, he has worked with major international companies as well as specialist technology companies. Measurement techniques he developed for Oil and Gas Measurement in the United Kingdom led to the production of a new sampling product to measure the water distribution in flows of oil and water. Since returning to New Zealand in 2015, he has actively pursued opportunities to drive business innovation within New Zealand companies, building on his overseas success. He has recently established a new programme of research with Magritek, a developer of cryogen-free, compact Nuclear Magnetic Resonance (NMR) and Magnetic Resonance Imaging (MRI) systems that work on the benchtop. He is also working with Eko360, a company specialising in innovative environmental products for growing plants, and seeks to use a mathematical model and novel measurements to rapidly prototype controlled release fertilisers. Cost-effective controlled release fertilisers have the potential to improve nutrient use efficiency especially with nitrogen fertilisers. The outcome being greater agricultural productivity while reducing leaching from the dairy and forestry sectors in New Zealand and internationally.